Display your favorite collectible in Model Display Case With Black Stand. 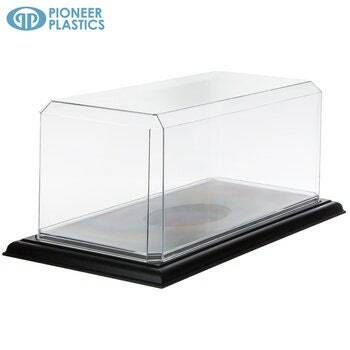 This large rectangular display case is completely clear and comes with a plastic black stand to set it on, making it look even more important and special! Display your football, or other long items in this case so it can stay protected and be admired from every angle. Cut-out the backgrounds around the box, including a grass image, football field image, and a classic car image! Display your model in a fun, festive way! Package contains 1 display case, 1 black base & 3 background choices.